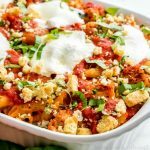 This Chicken Parmesan Bake is a classic comfort food recipe that's been made into an easy weeknight dinner recipe for back to school dinners. Cut up cooked chicken into bite-sized pieces. Add penne pasta to boiling water and cook for about 9 minutes, until just short of al dente. In a large bowl combine chicken, penne pasta, mozzarella cheese, Parmesan cheese, and sauce (reserve about a cup of the sauce and set to side). Toss until ingredients are coated. Pour mixture into a greased casserole dish. Add remaining cup of sauce to the top of the casserole and then add thin slices of fresh mozzarella cheese. 10 minutes before the casserole has finished baking add the breadcrumb topping and return the dish to the oven to finish baking. After 30 minutes remove from the oven and enjoy! In a small bowl combine crushed garlic croutons, Parmesan cheese, parsley, and melted butter. Toss until fully combined. The chicken can be frozen chicken (fully cooked), rotisserie chicken (shredded), or chicken breast (fully cooked). It is up to you!